Posted in Explore, Film, Fun	by C.
I had this internal dialogue back and forth in my head the entire time I sat in traffic on Sunset Boulevard fighting to get to Grauman’s Chinese Theater last Thursday. I had gotten passes to the world premiere red carpet screening for Sparkle. The passes simply meant that I had a chance to get in to see the film, but it was on a first-come, first-serve basis. While I’ve never been turned away from a screening, in this case, it wouldn’t have surprised me. I’d seen various outlets promoting the passes and the fact that the film featured the last performance from one of the greatest singers that ever lived, I knew would draw an even larger crowd. As I parked and made the nearly ten minute trek just to get to the line due to sidewalk closures, Hollywood Boulevard was bursting alive with activity around me. The red carpet was out, photographers everywhere, and onlookers stood across the street watching as celebs made their way down the press line and into the theater. Let’s not forget that this part of town is typically busy without a Hollywood premiere, and the summer season draws tourists by the masses. Needless to say, it was more than crowded. It was a zoo! Meanwhile, I was still having the “go home, no wait and see” conversation in my head as I stood in line telling myself “I’ll give it 30 minutes max then I’ll head upstairs and see what’s playing at the Chinese 6 instead.” Yet somehow, I got into mingling with a few of the other hopefuls as we waited in line. On top of that, you couldn’t ask for a better place to stand-back and people watch (a fun secret pastime of mine…shhhh). It’s then that the world becomes a larger place, full of different styles, cultures, looks, good fashion choices and plenty of bad fashion choices. Simply stopping and taking the time to look around you, to chat with a complete stranger and hear some of their stories can be so invigorating and was the best part of the experience. I did walk upstairs to the Chinese 6 Theaters at Hollywood and Highland, but I’d either already seen the film or didn’t have an interest in it (“Brave 3D is still out?”) so I headed home. 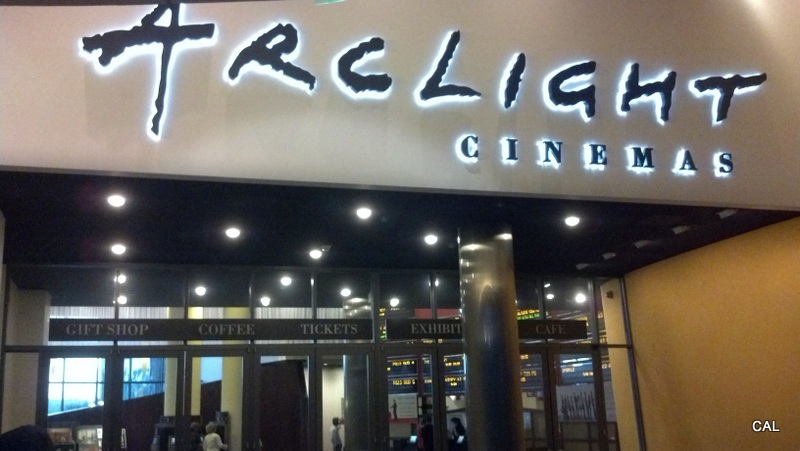 As they say, “one monkey don’t stop the show.” Enter the beauty of the Arclight. I took myself to see the movie Tuesday night, in my comfy pants, popcorn in hand, soda in cup-holder, and enjoyed every single frame! Of all of the celebrity deaths in recent years, Whitney Houston’s was the biggest shock to me personally (Michael Jackson a close second). It was because the last time I saw her, she was sitting on stage with Oprah looking as if she’d really turned it around and was headed toward true freedom. In the end, we’re all human. I think we forget that sometimes because someone is projected onto a big screen in front of you, making millions of dollars. We all have our opinions of how someone should be or shouldn’t be, but I choose to remember Whitney Houston as the beautiful woman I used to imitate singing in the shower or with a brush in front of the mirror. What a great way to leave this life and into the next in Sparkle.